Mogk, Jeremy PM, et al. "A simulation analysis of the combined effects of muscle strength and surgical tensioning on lateral pinch force following brachioradialis to flexor pollicis longus transfer." Journal of biomechanics 44.4 (2011): 669-675. Biomechanical simulations of tendon transfers performed following tetraplegia suggest that surgical tensioning influences clinical outcomes. However, previous studies have focused on the biomechanical properties of only the transferred muscle. 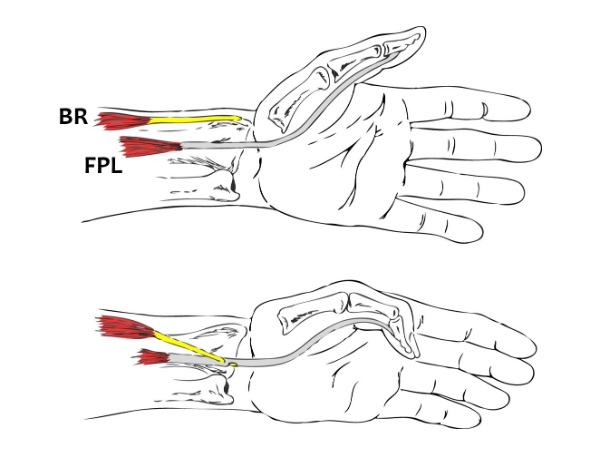 We developed simulations of the tetraplegic upper limb following transfer of the brachioradialis (BR) to the flexor pollicis longus (FPL) to examine the influence of residual upper limb strength on predictions of post-operative transferred muscle function. Our simulations included the transfer, ECRB, ECRL, the three heads of the triceps, brachialis, and both heads of the biceps. Simulations were integrated with experimental data, including EMG and joint posture data collected from five individuals with tetraplegia and BR-FPL tendon transfers during maximal lateral pinch force exertions. Given a measured co-activation pattern for the non-paralyzed muscles in the tetraplegic upper limb, we computed the highest activation for the transferred BR for which neither the elbow nor the wrist flexor moment was larger than the respective joint extensor moment. In this context, the effects of surgical tensioning were evaluated by comparing the resulting pinch force produced at different muscle strength levels, including patient-specific scaling. Our simulations suggest that extensor muscle weakness in the tetraplegic limb limits the potential to augment total pinch force through surgical tensioning. Incorporating patient-specific muscle volume, EMG activity, joint posture, and strength measurements generated simulation results that were comparable to experimental results. Our study suggests that scaling models to the population of interest facilitates accurate simulation of post-operative outcomes, and carries utility for guiding and developing rehabilitation training protocols.